Kaizen or “continuous improvement" is a philosophy aimed at the improvement of processes by eliminating waste, making work simple and undertaking such efforts on a sustained basis. It is a never-ending quest to create a better workplace, better products and greater value to stakeholders with one set of improvements becoming the basis to launch another set of improvements. Kaizen finds application in almost all areas including manufacturing, services, healthcare, banking, government and other industries. To be effective, Kaizen has to become a daily process or a routine activity ingrained into the normal workflow rather than a special intervention. A block diagram is a highly structured flowchart that presents a quick overview of major process steps, key process participants and relationships, and interfaces among the steps and the participants. It finds use in high-level applications that require an overview of the entire range of the process or the overall concept rather than detailed specifics of the project. A good analogy is a state map, which depicts only the main highways. Zooming inside reveals the county tracks and city roads. Similarly, the block diagram depicts only the events. Specific tasks and sub-processes inside the events may require separate flow charts and tables to provide an in-depth illustration. Block diagrams find use when new processes are designed or existing processes are improved. Kaizen events aim to present workable solutions to problems or tap latent opportunities and as such block diagrams ideally suit the Kaizen planning process. Download a free sample block diagram for Kaizen events from the Bright Hub media gallery. This sample block diagram illustrates a problem resolution process, which is suitable for any process. The arrows in black depict pre-Kaizen relationships, and the arrows in red depict post Kaizen relationships among events. The customer makes a complaint to the front office; the front office forwards the complaint to the process owner; the process owner identifies the root cause of the problem or explores various possible solutions to identify the best solution and informs the customer. The customer may reject the solution, in which case the process team suggests the next best solution. When the customer approves the solution, the process team executes the solution and informs the front office that initiated the complaint. The front office makes the necessary follow-up, collects feedback and follows up with the process team for any follow-up action or modification. For its part, the process team documents the incidents for reference. The block diagram is similar to an ordinary flowchart, but unlike a flowchart that contains only the flow of events, the block diagram illustrates the relationship between the different events and specifies the stakeholders of each event. The block diagram allows applying Kaizen. Use the diagram to study existing process and develop a Kaizen proposal that would eliminate waste and make the process simple. 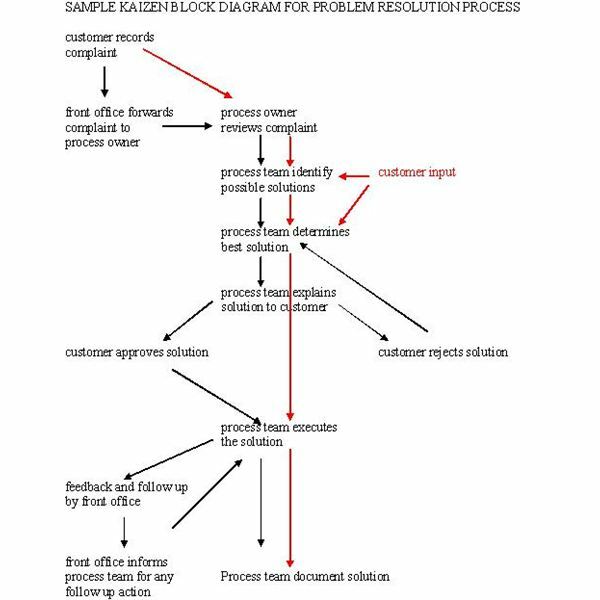 For example, referring to the sample block diagram allows the Kaizen team to consider eliminating the role of the front office for initiating complaints and follow-up and entrust the respective process owners with the task. This would make the work flow smoother and eliminate waste processes. Similarly, instead of going to the customer with a solution every time, a process modification that involves the customer when identifying possible solutions would help to save time and speed up the process. The red arrow in the sample diagram depicts such a modification. The sample Kaizen event depicted in the download is generic. Use the same structure for any Kaizen event by replacing the event description with whatever is relevant. Make sure to describe the specific event and the event stakeholders. Add, delete or alter the relationships as appropriate. Apply only a single problem in a single block diagram. Use separate block diagrams for each problem. Block diagrams best suit major and macro-level problems. 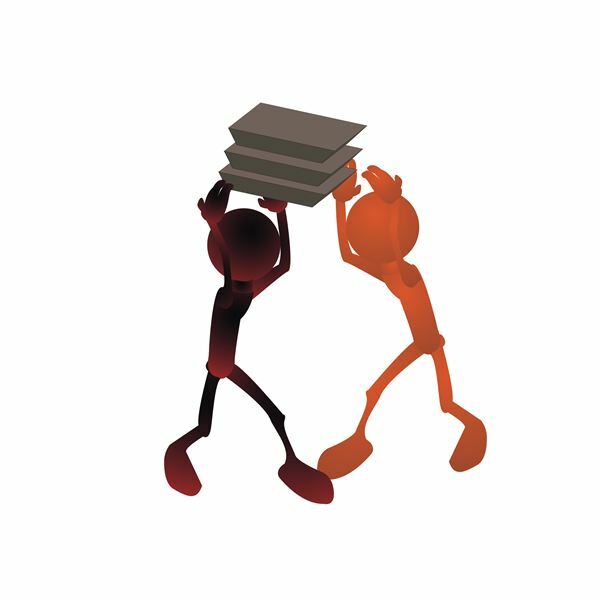 Minor, specific or straightforward problems are easy to resolve without making graphic illustrations. Kaizen need not resolve a problem completely or comprehensively. It is a tool to make improvements. When the improvements involve change, a gradual and incremental approach may work best rather than a drastic overhaul. As such, when the block diagram is prepared, focus on how to improve the existing process rather than concentrating on a desired result and trying to tweak process flows and relationships to meet such results. While the ends are important, applying Kaizen ensures that the means also receive due consideration.